Automotive urea, in case you were wondering, is not an animal derived product although we do excrete urea in urine, it’s at much lower concentrations. The stuff used in your car is a man-made substance created by exposing synthetic ammonia and carbon dioxide to heat. As well as being used in liquid form, AdBlue suppliers also make dry pellets for farmers to scatter on their fields as a form of fertiliser. Topping up the tank is simplicity itself. 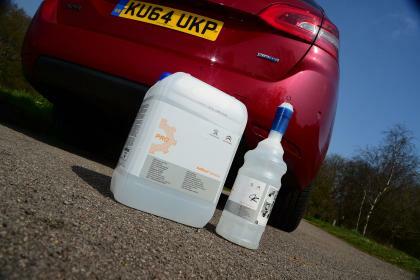 Nowadays the AdBlue filler cap is often located next to the diesel filler, and AdBlue is typically sold in handy containers that dispense without drips – important, as although the AdBlue is pretty harmless to people, it can be quite corrosive to vehicle paintwork or other less obvious things like your car’s wiring. It can also smell pretty bad if you spill a container of it on the boat – as we know from experience. AdBlue is available from Denbury Diesels, as well as accessory shops and chains. It’s also a staple of every filling station these days, but it’s worth shopping around as AdBlue prices can vary widely.